It's a String ThingChallenge: Why Not Join Us!!! please join me in my special quilting challenge. let's make lots of string quilts together and donate them to charities!!! left over from other quilting projects that you just can't part with called "strings"
If you need some help getting started, you can follow along with me or feel free to do your own thing!! You can look at my short tutorial on my method. the possibilities are endless and no two quilts will ever be the same. Let's see how many we can make in one year. We'll keep track of your progress here and then at the end of the year, go ahead and donate them to your favorite charitable organization. Let me know if you have a blog. I'd love to share it with all our readers. if you have any questions, feel free to ask them. I'll answer in the comments section. If you need some color controlled fabric strings, I will be offering some sweet assortments for sale in my store. LOVE this idea. I NEED the inspiration to use up my stash of strings! And there are several places I'd like to donate quilts to. I'd love to be a part of this challenge. I have made one string flimsy at this point and just love how it turned out. Can't wait to get it quilted and start on another. I would like to join you but I have never done a string quilt before. I hope that I will be able to complete the challenge. Looking forward to learning though. Yes!! After seeing pictures of your quilts yesterday I was checking out my strip box...and probably would have started one but thought I needed muslin for backing (nearest JoAnn or other fabric shop is 40 miles one way). Do the telephone book pages rip out easily, do I need to adjust stitching size? Count me in. Love stings but have never made one so this is my chance. 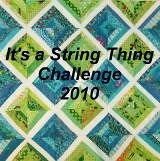 I am a fellow Haertsringer, I make lots of charity quilts, not always strings, but I would love to watch and play with the others on the group! I've made several string quilts already and I'm hooked. I use thin sew in interfacing for the foundation, so no tearing out of paper. I don't know that I can sign-up due to health reasons. However, I am a big fan of string quilts and quilting for donation in general. So I wish you luck and look forward to seeing your progress. I'm in! I just briefly looked thru your instructions, but I'm sure I don't know how to grab the button and put it on my blog!! I'll try a few times and if it doesn't work, I'll be contacting you, Stacey! What a great idea--thanks for starting this project. I look forward to working with everyone this year on the string challenge! Okay, so I signed up in the wrong place! Duh. I would like to join in this--I have loads of strings and a favorite charity--so I am all set. Count me in! I have strings cut and more than ready for use. I've made many string blocks with muslin or cheap, thin fabric for the foundations, but I've never done paper piecing. Is it best to use smaller stitches or larger ones for the paper to tear off easy? Also, when you tear the phone book pages, do you cover the whole page and then trim to 5.5 inches for a 5" finished block? I'm getting excited to start a new project!! Hi Susan, Take a peek at my tutorial. I just added it right after you posted your comment. I don't see my name so I'm telling you now. I want to join. Do you have light on the left of center and dark on the right or vise versa or are there any rules. I am going to try the phone books--we just got new ones about a month ago and we threw the old ones away--oops should have saved. Since I hate to read those small ones they will be excellent to tear up. Count me in. Tutorial is great. Hi Nancy, I really don't have a set plan with lights or darks on either side. I just color control each. Here is my other blog and you can see more photos of my color controlled quilts. I haven't had a chance to upload them to this blog yet. Maybe tomorrow. would love to join. I make preemie quilts for a level III NICU. Del Jeanne said " Can YOU get me entered? I said, "Count me in--I love making string quilts, and have lots of scraps to utilize in them!" OK, Stacey, I am in! This is just the motivation I need to get started on string quilts.....and I ADORE your controlled versions! Woo hoo! I'm in. I thought you need sashing to join the blocks? Can you just sew them together using a 1/4 inch seam? Can you leave the paper on before you square them as in paper piecing? Hi Matts Mom, Take all the paper off before you do any cutting. Press and then square up your block. Yes, I just sew them together with a 1/4 inch seam. Do you want your blog to be added to the blog list and then you will be able to post pictures of your progress and quilts? I just need to send you an invite. Hey there! I would so love to sign up for this. But at the moment we will be moving in a few weeks and a lot of my sewing stuff is already boxed up :o( bummer! But would you mind if I still take your Button to promote your challenge? I'm sure there are others who would like to participate for a great cause. Thanks! Hi Stacey, I am new to blogging and will have to figure out how to put pictures on the blog. So go ahead and send the invite. Second question. I used fundation paper as my base, have you ever used it? I have four 8.5inch blocks done so far. All scrappy. I will make 4 more. Now what? Yes I have used foundation paper. But I'd rather use the phone book pages. They are Free!! But back to your question. Tear out your paper, press, square up your block. Arrange your blocks on a design wall, floor, or anywhere else you can do some arranging. You can create different looks by how you arrange your blocks. Yours are scrappy so just stitch them together using a 1/4 inch seam. I try to get the seams going the right way (one up and one down) to avoid bulk, but sometimes it just doesn't work that way. Hope that helps and I am glad you are joining us. I just joined stashbusters today and found your post. Count me in. I love stings but have never made one so this is my chance. Hi! I'd like to join the challenge, too! My goal this year is to do a one-to-one quilting challenge...a lot of my friends are having babies soon, so I'm going to make one quilt for the baby and one quilt for a charity, for each of them. I can't promise all of them will be string quilts, but I'll do my best! I'm also SUPER new at this (I'm taking a break from my third quilt...ever! as I type), so anyone with tips and tricks is welcome to chime in if they see me doing silly things! I have a couple of quilting blogs...one for charity projects and one for friend projects. Please count me in! This sounds like fun and maybe will get my franny moving. I've made a couple of strings quilts and I love them. Please sign me up! I need a 'push' to get things done, anyway! [grin] I'm a part of Heartstrings as well, so, will probably be using fabric foundations. The smaller size sounds like a great way to do children's quilts, and manage to do one a day or so. See the beautiful West End of Washington state at my blog! I just tried piecing my first string block this week and I am addicted. I would love to join your challenge. Thank you for posting your method of using telephone book pages. I used muslin for piecing my blocks. Although, they look great (if I do say so myself), they are heavy so I am not sure if they will be difficult to quilt. My personal challenge for 2010 to to make a huge dent in my stash and to create 10 quilts to donate to charities. I would be happy to add your button to my blog. I don't have many viewers, but perhaps it will inspire one more person to join your challenge.